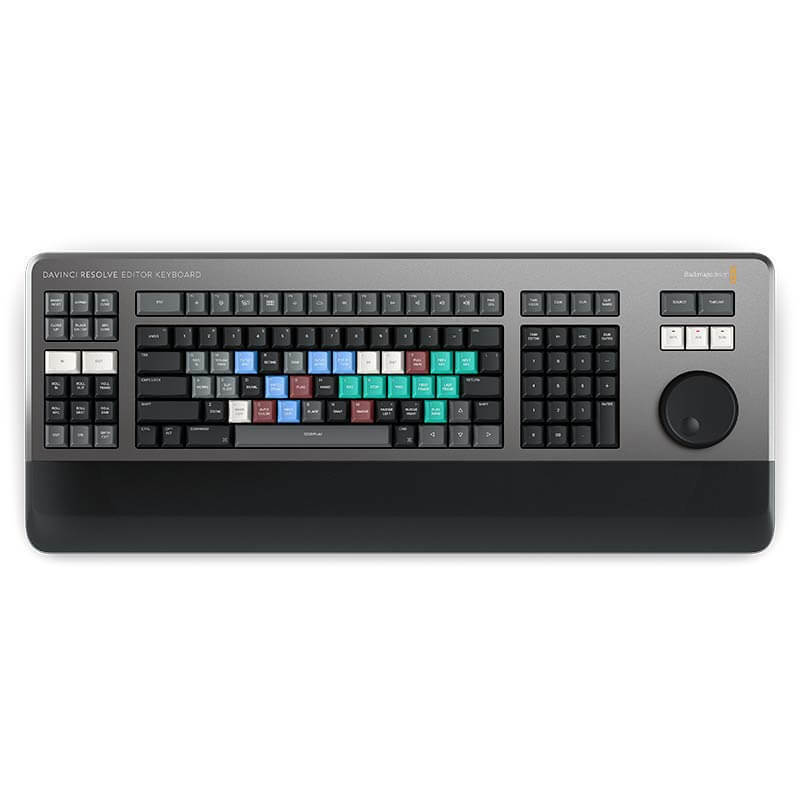 The DaVinci Resolve Editor Keyboard is designed for professional editors who need to work faster and turn around work quickly. 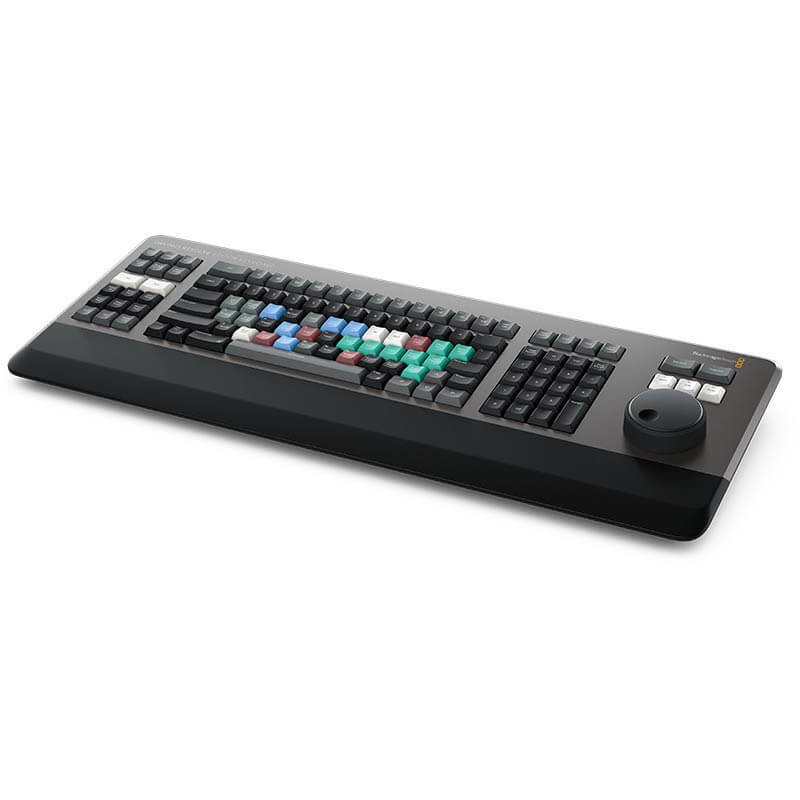 More than just a simple keyboard, the DaVinci Resolve Editor Keyboard has been designed as an alternative way to edit that’s much faster than a mouse because you can simultaneously use both hands at the same time. You also get an integrated search dial built right into the keyboard. Simply plug the keyboard into any USB‑C computer and you are ready to go. While most keys will work as a standard USB keyboard, the DaVinci Resolve Editor Keyboard has been designed for DaVinci Resolve 16 to enable an editing experience that's dramatically faster than previously possible. The source tape uses your bin's sort order so you get lots of control over how shots are organized. This gives you the flexibility to find shots by time, camera, duration or even clip name. The moment one of the bin sort buttons is selected, the source tape will be regenerated in that bin’s sort order. Simply scroll up and down the source tape to find the shots needed. Sort by timecode to see all the bin media sorted by time, which is perfect for content shot in time order, such as live events. You can also sort by camera which is great for multi camera shoots where you lay down the wide shot first and then look for cut-aways on other cameras. You can even sort by duration and the clip name. Entering edit points is one of the most used functions in editing, so we designed the in and out point buttons larger in size, and to include a small space above to allow locating them by feel. That helps when doing transport control with your right hand and punching in and out points using your left hand. When selecting in and out points in the new DaVinci Resolve cut page, you are also trimming clips with these buttons. Then once the in and out points are set, just reach your fingers up to the edit buttons. The in and out points can also be used to contract the source tape to limit the clips included. Then you can change the source tape back to the whole bin by pressing the escape key. 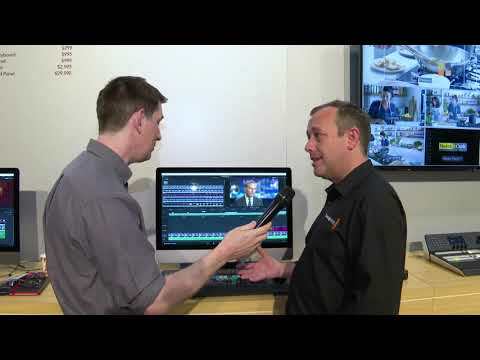 Smart insert is similar to the traditional insert edit function, however it’s smarter as it eliminates the need to switch to the timeline and place an in point. All you need to do is select smart insert and it will locate the nearest edit in the timeline and insert the clip in that location. The roll transition is similar to the roll edit. It works by rolling the transition between 2 clips and has the same affect as simultaneously adjusting the in point on the destination clip while adjusting the out point on the source clip. Roll edit does not affect timeline duration. Editing software is slow at adding transitions because it requires using drag and drop to place a transition, or a keyboard shortcut for only one transition type. 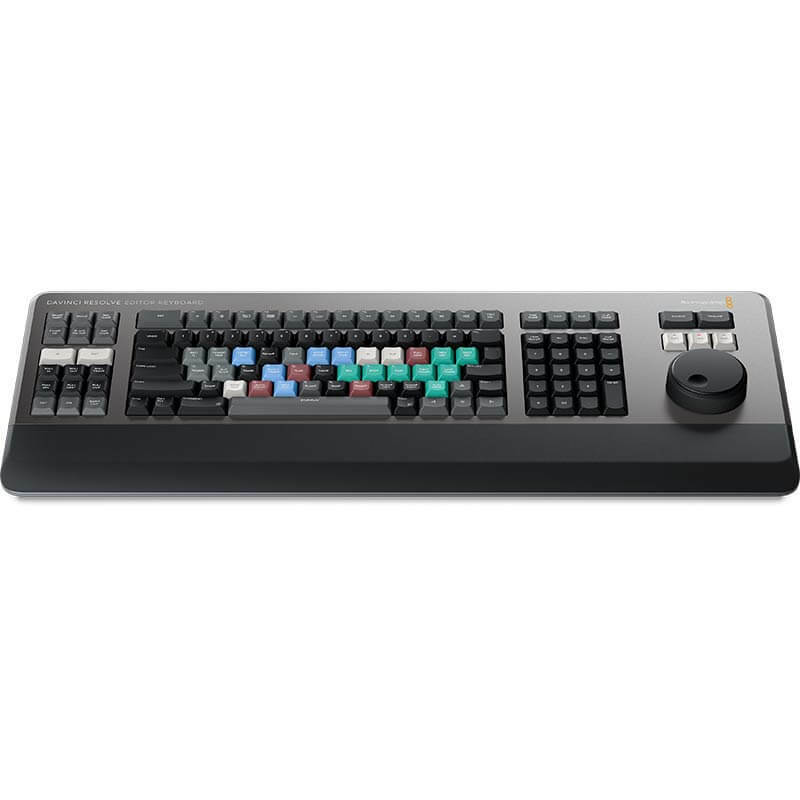 With DaVinci Resolve Editor Keyboard you can press a key and add or remove a transition with a single button press. The cut key will remove any transition on an edit point and leave it as a simple edit between the 2 clips. Pressing dissolve will add a 1 second dissolve between the two clips, and using roll duration will set the desired transition length. Plus if there is already a dissolve on the edit, then the key will be ignored. There's also a smooth cut button to allow jump cuts to be removed at the press of a button. The new DaVinci Resolve Editor Keyboard also includes a revised qwerty key layout that’s been updated using feedback from professional editors. However you still get all the traditional editing features for both the cut and edit pages in DaVinci Resolve, so the core qwerty part of the keyboard still operates in a familiar way. All the standard edit modes are included on the main keyboard. Plus you get JKL trimming when you want to do playback and trimming via the keyboard and not the search dial. But you still get new features in the revised layout, such as a viewer button to allow instant change to full screen view, and it’s even possible to edit from the keyboard in full screen view. When entering edit points and durations numerically, there's a keypad specifically designed for timecode entry. The F/TC button allows switching between timecode or frames. Just press the F/TC button and entry changes to frames. When typing longer timecode values, there's also a double zero button so you don't have to press the standard zero key as often. The plus and minus keys allow time values as offsets to current values vs absolute entry. A dedicated duration entry button allows you to numerically define the duration of a clip. Numeric duration entry is one of the most used functions. For example, if you need to set a 100 frame duration on a clip, just press DUR, F/TC and 100. Designed for the Desktop or Inset into a Console. 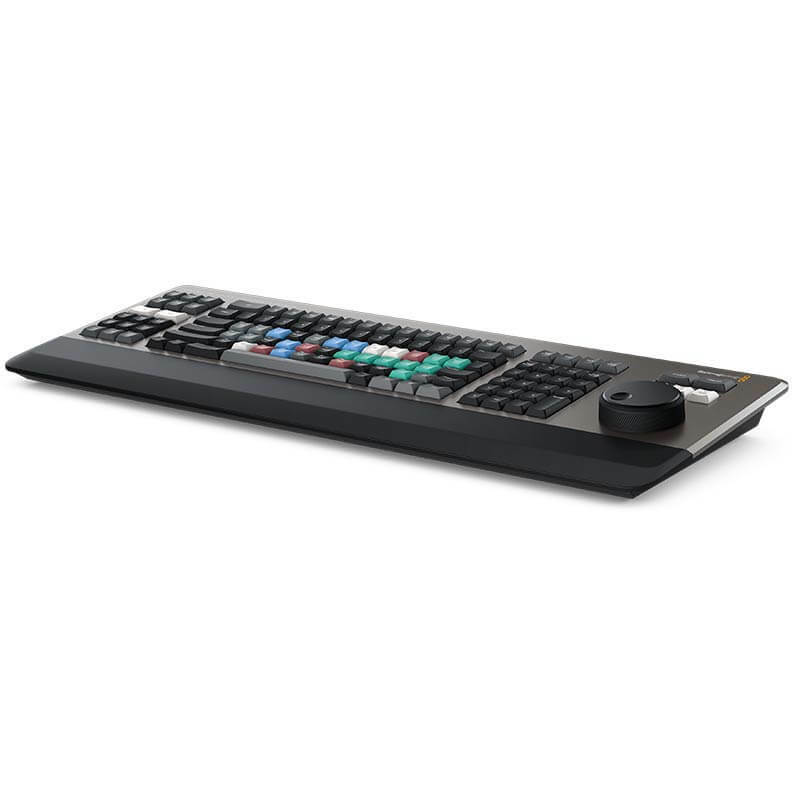 Although the DaVinci Resolve Editor Keyboard has been designed with a modern aesthetic, there's also function to the form. The subtle edge created by the mating of the top keyboard surface and the lower chassis has a pinstripe feel to the design that allows the DaVinci Resolve Editor Keyboard to look good on a desktop. The keyboard is a fantastic match to an iMac Pro and has a subtle energy when placed on your desk. There's even fold out rear feet to increase the keyboard tilt. However the flange has a functional benefit as you can install the keyboard in a cutout of a desk or console. The keyboard will then sit almost perfectly flat on the desk surface. This creates an amazing console look.